On Thursday, the husband’s Aunt Maureen passed away after a battle with lung cancer. On Sunday afternoon we were all in Chicago at the wake. A real, no kidding, Chicago Irish wake. The whole family and close friends, kids included, spent the afternoon and evening visiting and kneeling in prayer and playing Uno, all with Aunt Maureen’s body visible there in the corner. And my kids, aged 5 months to twelve years, were unfazed. Wakes and funerals were not a part of my upbringing, I never saw a dead body or even went to a Catholic funeral as a child. Death was something mysterious and unknown. When people died, they just went away. But the husband figures he went to a wake once a month growing up in Chicago. Death and grief were a part of his childhood. We have decided that that’s what we want for our own kids. We don’t want to hide death from them. We want to help them understand and process it appropriately. 1. People have a soul. The soul is what animates the body. Aunt Maureen’s soul wasn’t in her body anymore, it went to eternal life. Seeing the body of someone they knew well helped our kids understand this. We told them what to expect ahead of time. When we arrived at the wake, the kids knelt before the coffin and said a prayer for the repose of her soul. Then they went off to play with their cousins. I can’t speak for all kids, of course, but I’m pretty sure my kids weren’t uncomfortable with it because we weren’t uncomfortable with it. More upsetting to my kids than seeing the body was seeing how upset their Gramma and Papa and other family members were. It brought the older ones to tears themselves. But I don’t think grief is something that needs to be hidden from children. Watching other people process grief will help my kids understand how to process it for themselves. Taking a family of nine halfway across the country on a couple of days’ notice is no mean feat. But it was worth the effort. My kids could see how much it meant to their grandparents and to Uncle Dave to have us all there with him. Having children at the wake is a visible sign that life does go on. There’s a lot of comfort there. And distraction. And comfort. Seeing their dad as a pallbearer, actually helping to bear the weight of Aunt Maureen’s death for our family is a powerful visual sign for our children. 4. The Mass is a Celebration in any Context. It’s easy to focus on happy sacraments. We all want our kids to be a part of baptisms and weddings. But I also want my kids to see funeral Masses. I want them to see the way our faith brings us together as the Body of Christ to support each other in tough times, not just good times. We’re back home now. I asked the kids in the car on the way home from the airport what they thought of our trip. So . . . we each learned something. had a similar upbringing (didn't really see anyone dead until college), and I really do think it affects how I feel at funerals now. I like your approach. Saying prayers for your family for peace during this difficult time, too. Great points. Coming from a large extended family, I grew up attending a lot of funerals too (not one a month, but certainly more than I can count). I'm grateful for the experience. I think being exposed to death (and the dying – we should be honest with children about what leads up to death too) as a child not only prepares you to deal with it as an adult, it helps you to really understand that our lives here are finite, and therefore very, very precious. This is a wonderful post. 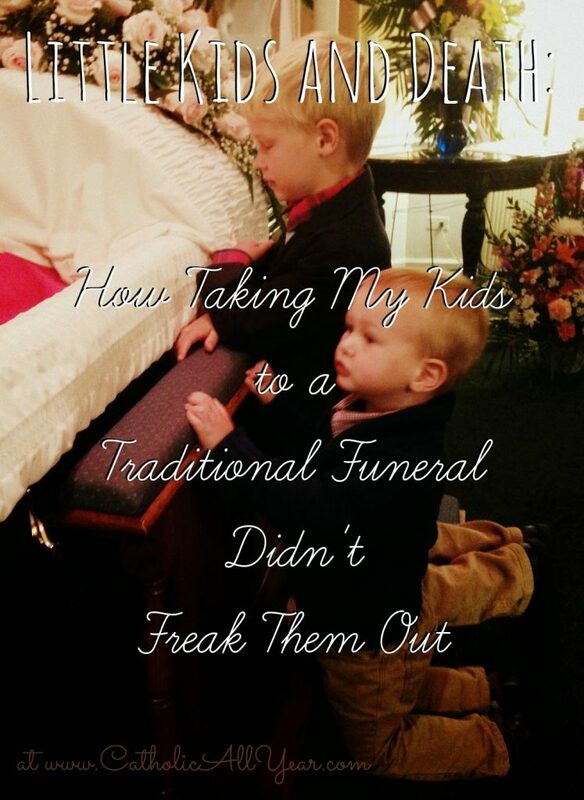 I took our children to my husband's grandmother's funeral almost two years ago, and they weren't freaked out by seeing her body in the coffin either. At the time I was not a believer, so I did not explain things to them as I now wish I would have, but I'm still glad to have had them there to see their great-grandmother and the lovely funeral Mass. It was a moving experience for our whole family, and I really like the way you describe it here. I'm sorry about the loss of your husband's aunt. Prayers for her soul and your family. I do agree about taking kids to funerals. Our kids have only been to 1 that they would remember (my grandmother) but I think it meant a lot fo them and to everyone else to have them there. This is great. 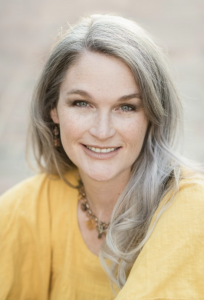 As a wee one, I wasn't freaked out by death or funerals, either, because it was such a common part of my life (many friends/family members have passed away) – but then death is part of life, so it all makes sense. My mom just told us that the deceased was still alive, but in a different place, and I guess that satisfied us until we needed to know more. I grew up Irish Catholic and attended many funerals for family/friends as a little girl. I even crawled into my grandmother's casket as an almost three year old! So many wonderful lessons and a real experiencing of life for your kids. And the cookies. Priceless! What a cutie! My grandmother just passed away last month at the age of 95. All five of our children, aged 5 to 13, were very close to her, and I felt exactly the same way about "exposing" them to the reality of death and a funeral. My 5-yo twins had been to their first funeral last year when my grandfather passed last year, so they were our resident experts. I just think if you explain things, matter-of-factly, biblically, and answer their questions honestly kids aren't so freaked out by things like many adults seem to be. Most recently was my grandmother and she was very old at 105, but she was independently living and just visited her the week prior to her death. We also say her one last time at the hospital two days prior to passing and she looked really bad. I brought my two older ones with me so we could say prayers with her. Dead people are easy, dying people that's hard. OK that's sounds terrible… What I mean… I will find the right words later. Why would people hide children from a funeral in the first place? And my boys were more interested in the embalming process, then anything else. I told them they could ask any awkward question they wanted to the funeral director. That's funny! I was really impressed with the funeral home we used. It was a family business, which somehow seems like the way it should be. I'll bet our guy would have answered questions! I'm sorry for your loss. My great Uncle passed this month too. I took our children to the wake and funeral. My oldest is only 5, but I explained to him beforehand what to expect. He was not at all shocked or upset and wanted to go see his body. He spontaneously knelt on the kneeler, folded his hands and bowed his head in prayer. I stepped back with my dad to give my son a moment alone with Uncle Johnny. My protestant minister father was very affected by seeing my son kneeling in prayer and he teared up and let out a chuckle (he can be a real terror from time to time). My son got up and came over to us and said, "could you keep it down? I'm trying to pray over there." Whenn he was done praying he say down with Grandpapa and told him, "Uncle Johnny's soul is gone. That's his body. We are gonna bury it so Jesus can come get it for him later." Outta the mouths of babes. I come from a large Italian family and I grew up in the Chicago suburbs. I also grew up going to wakes and funerals several times a year and it didn't phase me either. It was part of life for me. My family suffered losses of those who died of old age and some tragic losses. I was 5 and 6 years old when I went to the funeral of my 16 year old cousin and my 27 year old aunt. My grandmother took me to the cemetery everytime she babysat me. The cemetery never scared me. I enjoyed going there. My parents told me that when my young aunt died tragically, I kneeled by her open casket and asked where she is going and they hesitantly tried to tell me she died and going to heaven and I said "No I mean which spot in the cemetery is she going so I can visit her!" They were a little weirded out but happy that I wasn't freaked out about death at 5 years old. My kids have already been to two wakes and funerals and I don't ever plan to keep them from a wake with an open casket. Great post! And I am very sorry for your loss. Prayers for your family! I loved how on the drive home from the airport, Gus said that Papa needs to get extra hugs this weekend because Aunt Maureen is his sister. So incredibly sweet and thoughtful–it was nice to have all of the kids there. This is great and I agree with everything you say. We talk about death a lot and I think it's been very good for all of us to keep in mind that our time is limited and that we are not in control of our lives. In addition to being "comfortable" at funerals, my children see cemeteries as a place to pray, which I really like. Even the two year old gets excited when he notices a cemetery and reminds us to pray (usually a Hail Mary and prayers for the souls in purgatory). At least once a month I try to drive through the Catholic cemetery near our house and pray for the souls of the people buried there as well as our family members whose graves are elsewhere. I love that my children have such positive, holy associates with cemeteries as I grew up pretty scared of them. I grew up going to funerals and what I still find surprising is how different my reaction to each one is. This week marks the anniversaries of funerals of two of my grandparents — both big Irish Catholic affairs. My grandfather's funeral last May after a long battle with COPD was actually a really meaningful and constructive time for our family, and most of the time we were laughing and remembering the fun, active patriarch of our family rather than the sickness and depression he'd been dealing with for years. But the funeral of my maternal grandmother (who died eleven years ago today, actually), was really tragic, even though she had also been sick many years. She had been until the end a very vibrant and loving woman, and our family had many very young grandchildren and grandchildren she would never meet. The beauty of the Catholic funeral to me is that all of these kinds of emotions and more are part of them — they really tap into the root of the experience of living, dying, and grieving in an amazing way. Honestly, one of the most beautiful funeral masses I attended was for two of my close friends (sisters) who died in an accident 9 years ago — the peace and beauty of the mass had never been more apparent to me before, which was very striking to a 15 year old. I'm sorry for your loss. May the Almighty comfort you. We took our kids to visit family friends sitting Shiva. Even some of our younger kids went to the public funeral of Ariel Sharon this past January, and we have attended a few funerals. Funerals are quick here: body wrapped in a shroud, buried the same or next day most of the time. It's part of life, and we find comfort of the observances surrounding a death in Judaism. Now the creepiest funeral I've been to was Catholic, but it had nothing to do with mass or other traditions, but some of the talks graveside… People in the Irish half of my family are plain weird. Well, so are the ones in the Israeli half, but that is to be expected. The creep factor of that first funeral I went to was enough to keep me away from any wakes or graveside services for a long time: I only went to Mass. My parents always took us to the wakes/funerals of family members when we were kids. It wasn't traumatizing or disturbing at all. Actually, I remember enjoying them. It was so nice to have all my aunts, uncles, and cousins around each day for three days, talking, playing, and remembering the person we lost. But I wish I'd been taught as a child the importance of prayer for the dead. I'm certainly not *hoping* anyone we know passes away soon, but when it happens, I intend to take my kids to the wake/funeral and use it as an important opportunity to teach them about death and eternal life. Claire, I just came on here to thank you for your comment (I get them via email as well as on here) because my kids had specifically asked if wakes in Ireland are the same as wakes in Chicago. I really found it very interesting. If you deleted it in error please let me know and I can cut and paste it back in. Thanks for all the good wishes everyone. Aunt Maureen was a truly wonderful person, she took care of everyone: siblings, children, grandchildren, her father, more grandchildren. Her whole life was a gift of service to others. She's a real inspiration to me. And her wake and funeral were an unexpected blessing of having our whole Tierney side of the family together for two days. What a blessing to have such a wonderful aunt and such good memories of her. My family viewed wakes and funerals in a pretty healthy and balanced way, I think. My brother and I were taught that going to a funeral was a natural and respectful way to show people that we cared about the person who had died. Anyway, I think being welcome at funerals from such a young age means that I process death a lot more easily than some of my peers. It's easy to be calm about everything when you're familiar with the process. My husband's uncle passed away on Easter Sunday. We brought our six year old because, as we were raised, death is part of life. He was curious and I answered his questions as appropriately as possible. I think he kinda enjoyed the Divine Mercy Chaplet (he hadn't heard it before…. I know… bad Catholic mommy). Thanks for posting this. I love your blog! I grew up in Ireland until 22 and in my experience we have wakes in the home of the deceased, though usually the body will be placed in a bedroom and people go in to see it. Visitors do sit around the home and talk though and all the family will provide food for them. Young girls make a lot of sandwiches!! Then on the day of the funeral, maybe 3 days after the death, the undertakers who prepared the body will come back and direct things, and the body will be carried out in the coffin by family members and walked for a while behind the funeral car (especially if they are a 'country person') and then maybe if it is a long way to the church they will travel to the church in the car. Or after the funeral in the church if it is a graveyard farther away the body will be walked down the street from the church and the street will come to a stop. This is the country Irish way. I am not a city girl so can't speak for that! People do pay their respects and death is faced. I kind of hate the American way. The anonymous funeral home…it's not the same. I remember very vividly going into each bedroom to see my grandmother after their deaths, and it was good for me to be absorbed into that 'adult' event with my parents guidance. So glad you were all able to go and experience the joy and the sadness. Thank goodness for Southwest. This is a wonderful post- I agree with you that it is much better for children to be exposed to death early on. Mainstream US culture does such a disservice to children. It turns out being bubble-wrapped your whole life makes you a whole lot easier to bruise when it comes off. Kudos to you for this! Thank you for sharing on this topic. Solidifies my inclinations – like I know I don't want it to be weird and hidden, but at what age. Your post reminds me that it can be any, in the context of their own family providing the necessary safety and context in which to process. The Catholic Funeral Liturgy is one of the most beautiful prayer experiences there is. Period. So moving. I am a DRE and I love walking into the church and seeing the Paschal Candle out, knowing there will be a group gathered in a few short hours to usher someone into their eternal home and recalling their dying and rising with Christ in their own baptism. Amazing. I'm very sorry for your family's loss, Kendra – how nice you were able to be there. We have always brought our children to funerals (of course with plenty of explaining beforehand if there was an open casket, reminding them that people would be crying, etc) and one of the blessings of that was that when my father died, it was less traumatic for them – easier, I think, to learn about death and funerals when it's not someone so close to you. We knew my father had terminal cancer as soon as he was diagnosed, and he was on hospice for several weeks before he died, and my children were very present for the whole process — all four of them (aged 7 months to 12 years) were with him when he died. We always explained what was going on — when he needed more medical equipment, or when his breathing became very loud at the end, and they never seemed troubled as long as they understood what was happening. I thought they would be intimidated by all of the tubes at the end, but one of my most precious memories was when my 9 year old asked if he could climb into bed with my dad, and just sat snuggled up with him completely unfazed by the oxygen and the catheter tubing. The hospice nurses were a great help in showing the children how to be comfortable around a dying person, just by the way they spoke to him and acted with the family. And of course the fact that my dad was a man of deep faith whose peacefulness and joy even while suffering terribly made it much easier to know it was the right thing to have the children so involved. The funeral was sad and emotional, but I think gave us all an outlet to express our grief and love. And we'll always laugh remembering how I suddenly realized when my father was close to death that I'd better explain to my 4 year old that Papa's body would remain on earth (because we'd been talking about how Papa would go to heaven) and she answered, "Oh – I thought Papa was going to explode through the ceiling."